- Choose background maps (standard, hybrid, satellite), search locations, add them to bookmarks and always stay out of harm’s way. - Monitor all important National Weather Service watches, warnings and alerts in the form of interactive polygons on the map. Tap one to see the full alert text. - Sunrise & sunset time. Radar images: the US (Continental US, Alaska (except northern), Hawaii, Guam, Northern Mariana Islands and Puerto Rico), Mexico (northern), Canada (southern), Australia, the UK, Ireland, Germany, France, the Netherlands, Italy (northern and north-western), Denmark, Austria, Sweden, Finland, Spain, Portugal, Switzerland, Norway, Poland, Andorra, Japan, Taiwan and more. See the full list on the developer’s website. Precipitation map, satellite images, detailed weather info, hurricane & lightning trackers: worldwide. NWS watches, warnings, advisories: the US only. - Our prime goal is to improve continuously and make your weather tracking experience better with every update. Love it b/c it let’s me look at the weather in other cities before I finalize my travel plans so I will know what the weather will be where I’m going and the outlook for several days which makes it easy to make decisions to still go or postpone due to possible bad weather forecasted. For example I was planning a trip to the Mountain here in Asheville, North Carolina and found that the weather was not going to be in my favor due to snow. First, I’m disabled and can’t take chances on being stuck somewhere I’m not able to get back home cause they shut down the highway when bad weather comes. Second, where I currently reside in North Carolina we get plenty of bad weather from snow, sleet, freezing rain and blizzard (due to nor Easters). I don’t take chances at home so why would I want to take chances somewhere else. I can’t take a risk of falling b/c of several medical issues that restrict my ability to get around (both knees been replaced and currently waiting on date for lower spine surgery) along with several other medical issues that restrict my ability to just go and take unnecessary chances. This app helps me make smart decisions that will best help me protect my health. Love it. It’s a 5 Star App. Highly Recommend you get it if you don’t already have it. Thank you for your honest and detailed review! We are very much happy to know that our app is so useful to you! Thank you very much for using it and for sharing your feedback with us! Downloaded the app, authorized the download with my fingerprint, then opened the app and was immediately prompted by another screen asking for my fingerprint, right after I said that I didn’t want to pay, that I just wanted the free version, they don’t clarify that the free version is 7 days free, and after that is paid. When it prompted me the second time for my fingerprint, I never thought I’d be paying a week later, since I selected the free version. I know they’re going to say “but it says on the screen that it’s not free” thing is, they use smaller fonts and on the bottom, making it deceiving and impossible to see at first glance. Also, NOAA is a government agency, pretty much the “Weather Bureau” (as you used to be called) you’re funded by taxes, literally “for the people by the people”, why do you charge people for an app, that only mirrors something that it’s already paid for with tax dollars, I know there’s app developers and support and everything, but the department doesn’t live off these payments through the AppStore, your department has an anual budget, so why, WHY, why charge people for something that’s already paid for, AND SUCH AN OUTRAGEOUS AMOUNT!? Sorry for a possible confusion. We’re not affiliated or endorsed by NOAA. This information is provided in the app’s description and in the app’s help file under the Acknowledgements section. The NOAA part in the app’s name serves as reference to the original source of the radar data. Besides, we have a permit from NOAA to use it’s name and logo. We're sorry for all these inconveniences caused by our app. The application does not initiate a payment unless you subscribe for Premium. If you had a free trial and haven’t canceled it, the account should have been charged only after the end of the trial period and then automatically according to the duration of your subscription plan. You can always cancel it through your device Settings - iTunes & App Store - Apple ID - View Apple ID - Subscriptions - Manage. Otherwise please contact Apple support directly. Thank you! This would be a 5 star app if it werent for full screen ads that come up in seconds after opening. And weather details that slide open/closed/open/closed so cant read the forecast! Weather Channel app opens to beautiful scene, gives forecast and if scroll we can see radar, week ahead, etc. Sorry developers, you still after all these months cant get this NOAA app to function well. Instead of creatively having ads within the app page the pop-up ads cover full screen, often X to close ad is hidden, cant get ad to close. After getting to page the weather report that pops out of the right side goes away before you can read it, weather is gone and wont come back until you keep clicking, dragging etc. or close app and open again, but then you get another page covering ad again. Shame the app developers dont know how to build an app that has ads creatively in them like so many other apps. Deleted this again, I love the Weather channel app SO much better! Sorry for the inconvenience. You can get Premium subscription and get rid of ads. 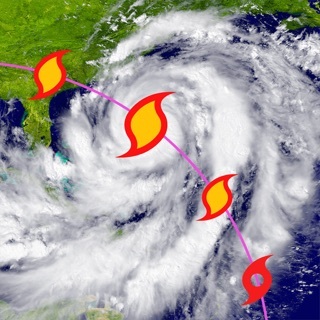 In addition, the subscription allows access to Hurricane Tracker with alerts.